We begin today with WOLF PACK PRIDE!! As we head into the “home stretch” of the school year — we need to do something FUN to get our minds off of all this STRESS. So next week, we’re bringing back the always popular promotion: SPIRIT WEEK at WMS!! That’s right, every day next week, students and staff are encouraged get into the SPIRIT and dress-up with the daily theme. Here’s the rundown: Monday is WMS Spirit Day — so dress in blue-and-white or wear your favorite Williamsburg gear. 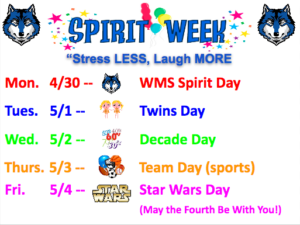 Then Tuesday we’ll be seeing double on Twins Day; Wednesday will be a blast-from-the-past with Decade Day; Thursday is for all our sports fans with Favorite Team Day; and finally, in honor of May the Fourth — next Friday is STAR WARS DAY!! So get into the school spirit, wolves, and BE A PART OF THE PRIDE!! This just-in to the WOLF-TV newsroom: WMS student-reporter William S. Burg — aka Wolfie — is reporting that something STRANGE in going on in the woods around school. Let’s take a look! Thanks for that report, Wolfie — and we’ll on be on the look-out for any more of these unusual appearances. The Spring Play rehearsal has been CANCELLED for this week. But practice will resume next MONDAY after school in the auditorium. Be aware that next week’s rehearsals will run until 6pm, so be sure to bring a snack. See Mr. Brown with any questions. Who wants pizza? The WMS Model UN Club will hosting a pizza fundraiser TODAY after school in the Main Lobby and by the Cafeteria. You can get a slice of pizza AND a cookie for just 2-dollars — and all money raised will go to support the Model UN and its future conferences. Come hungry! A traditional public school education has always emphasized the three-Rs — reading, writing, and arithmetic. But times, they are a-changin’. Student-reporter Josue C. investigates the evolution of education — which is getting more “high tech” every day. The WMS School Store is OPEN FOR BUSINESS!! TODAY is the deadline to pre-order your grade-level “School Spirit” t-shirts. They’re 18 or 20 dollars to buy. Just give the completed order form to your TA teacher — or bring it to the school store during Wolf Time. So get your School Spirit ‘T’ — and Be a Part of the Pride!! The WMS Kindness Club will be meeting next TUESDAY during ASP 1 in room 134. There a ton of fun activities lined up for rest of the year — so you won’t want to miss it! And new member are always welcome. See Mr. Johnson, Ms. Schaefer or Ms. Zeller with any quesitons. “Every HERO needs a squad! !” The WMS Pennies for Patients fundraiser is in the home stretch — raising money for the Leukemia & Lymphoma Society, and its fight against cancer. Keep the donations coming — because whichever TA collects the most money will get a free pizza and ice cream party!! Plus: be sure to buy a ticket for the Gift Basket Raffle — on sale this week during all grade-level lunches! These amazing baskets are filled with goodies and gift cards — just for YOU! Winners will be announced next TUESDAY, and all money raised from the raffle will be added to our Pennies for Patients total. See Ms. Kia at the Check-In Program with any questions — and support the Pennies for Patients fundraiser! And finally today — who’s up for a binge-watching marathon?! Student-reporter Damla O. has been watching a LOT of TV lately — and she’s got a tip on some great new shows. So let’s tune-in to Show-and-Tell!! Stay tuned for a special presentation of CNN 10 on WOLF-TV! !